Elite Image Remanufactured Toner Cartridge - Alternative for Panasonic (UG3313) - Replacement fax toner cartridge is manufactured with new after-market components, ultra fine particle toner and a sealing process that ensures a leak-proof cartridge. 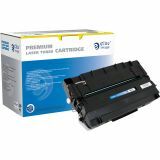 Toner cartridge provides crisp, sharp text and graphics on each fax document. Designed for use with Panasonic PanaFax DF-1100, DX-1000, 2000, UF550, UF560, UF770, UF880. Yields 10,000 pages. Elite Image is ISO certified.